In the vicinity of Martinsburg, VA, in the winter of 1862, General Thomas J. Jackson was directing his men to tear up as much of the B&O Railroad as possible. While he and his staff were making a reconnaissance of enemy positions, a beautiful young woman who had heard of the General's presence, ran out to meet him carrying her 18-month-old child. The young mother then handed the child up to the General and asked him to bless it for her. 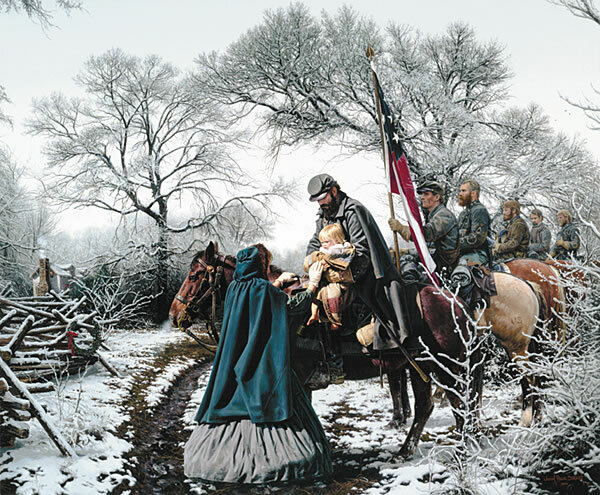 As the young woman placed her hand on Little Sorrel and bowed her head, the two joined in prayer as Stonewall Jackson gave a Christmas blessing.—painting by Civil War artist John Paul Strain. Ought It Not Be a Merry Christmas? Even with all the sorrow that hangs, and will forever hang, over so many households; even while war still rages; even while there are serious questions yet to be settled—ought it not to be, and is it not, a merry Christmas?" But Christmas also made the heartache for lost loved ones more acute. As the Civil War dragged on, deprivation replaced bounteous repasts and familiar faces were missing from the family dinner table. Soldiers used to "bringing in the tree" and caroling in church were instead scavenging for firewood and singing drinking songs around the campfire. And so the holiday celebration most associated with family and home was a contradiction. It was a joyful, sad, religious, boisterous, and subdued event. The Christmas tree became more accepted and popular throughout the second half of the nineteenth century. Americans added more homemade and store bought ornaments, and began to prefer much larger trees that stood on the floor, moving away from the table top trees that were popular in Europe. President Franklin Pierce was the first to bring a Christmas tree into the White House in 1856. This illustration by F.A. Chapman, titled ‘The Christmas Tree,’ is from the 1866 edition of Christmas Poems and Pictures, published by Hurd & Houghton, New York. Many of the holiday customs we associate with Christmas today were familiar to 1840s celebrants. Christmas cards were popularized that decade and Christmas trees were a stylish addition to the parlor. By the 1850s, Americans were singing "It Came Upon a Midnight Clear," "Oh Little Town of Bethlehem," and "Away in a Manger" in public settings. In 1850 and 1860, Godey's Lady's Book featured Queen Victoria's tabletop Christmas tree, placed there by her German husband Prince Albert. Closer to home, in December, 1853, Robert E. Lee's daughter recorded in her diary that her father—then superintendent at West Point—possessed an evergreen tree decorated with dried and sugared fruit, popcorn, ribbon, spun glass ornaments, and silver foil. Clement Clarke Moore, a religious scholar who for decades was too embarrassed to claim authorship of the 1822 poem, "A Visit From St. Nicholas," was now well known for his tribute to Santa Claus. "Santa Claus" made his first public appearance in a Philadelphia department store in 1849, marking the advent of holiday commercialism. For enslaved African Americans, the Christmas season often meant a mighty bustle of cooking, housekeeping and other chores. "Reward" for these efforts was a suspension of duties for a day or two and the opportunity for singing, dancing, and possible brief reunions with separated family members. Further gestures of "goodwill" by masters who saw themselves as benevolent owners were small and the semi-annual clothing allotment. "Christmas has come around in the circle of time, but is not a day of rejoicing. Some of the usual ceremonies are going on, but there is gloom on the thoughts and countenances of all the better portion of our people." Men of the 5th New Hampshire engaged in a hilarious greased pig chase as their Christmas entertainment. From Frank Leslie's Illustrated History of the Civil War. Events proceeded quickly in 1861, hastening war. Abraham Lincoln became the 16th president of the United States in March and the bombardment of Fort Sumter occurred in April. Southern states seceded and the Confederates claimed their first major victory at the first battle of Manassas. For the shopkeeper or farm boy or student away from home for Christmas the first time, melancholy set in. Robert Gould Shaw, then a 2nd lieutenant in the 2d Massachusetts Infantry, writes about guard duty near Frederick, MD. He would later earn fame as the commander of the heroic African American unit, the 54th Massachusetts. "It is Christmas morning and I hope a happy and merry one for you all, though it looks so stormy for our poor country, one can hardly be in merry humor." "You have no idea how lonesome I feel this day. It's the first time in my life I'm away from loved ones at home." 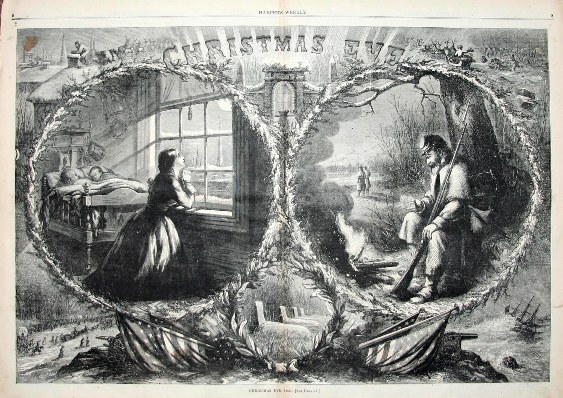 On the civilian front, Sallie Brock Putnam describes Christmas, 1861 in Richmond, VA. Yet Christmas 1861 also saw soldiers full of bravado, still relatively well fed and equipped, and eagerly anticipating Christmas boxes of treats from home. Often officers authorized extra rations of spirits and men engaged in greased pig-catching contests, footraces, jumping matches, and impromptu pageants dressed as women. Soldiers erected small evergreen trees strung with hardtack and pork. Some were excused from drills, although other references point to the need to haul logs and forage for firewood no matter what day of the year it was. Artist Winslow Homer depicts soldiers' joy at receiving holiday boxes from home in this 1861 Harper's Weekly illustration. By Christmas, 1862, Thomas Nast had allied Santa Claus with the Union Army and Abraham Lincoln termed the politicized Santa ‘the best recruiting sergeant the North ever had.’ From Harper's Weekly, January 3, 1863. This sad year brought forth the war's impact full force with battles at Shiloh, Manassas, and Antietam, and campaigns in the Shenandoah Valley and the Peninsula. Many Fredericksburg, Virginia citizens were homeless or fled their town just prior to Christmas. Harper's Weekly illustrator Thomas Nast, a staunch Unionist, is now depicting Santa Claus entertaining Federal soldiers by showing them Jefferson Davis with a cord around his neck. Abraham Lincoln would later refer to a politicized Santa as "the best recruiting sergeant the North ever had." 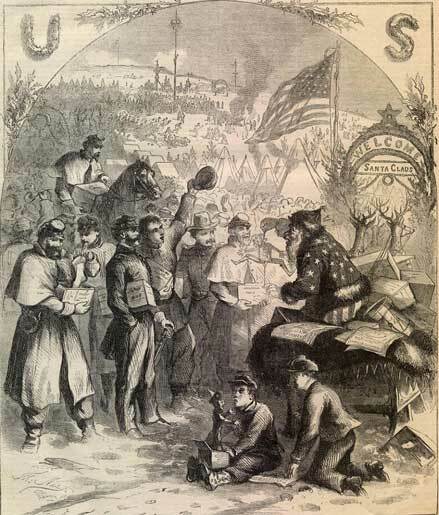 More moderate illustrations show soldiers decorating camps with greens and firing salutes to Santa. Ironically, it was Nast who fixed Santa's home and toy workshop address at the "North Pole" "so no nation can claim him as their own." Officers of the 20th Tennessee gave their men a barrel of whisky to mark the day. "We had many a drunken fight and knock-down before the day closed," wrote one participant. But there were other more somber occurrences recorded for Christmas 1862. One account tells of soldiers being forced to witness an execution for desertion and another grim letter describes how men firing their weapons in a funeral salute were mistakenly punished for unauthorized holiday merrymaking. 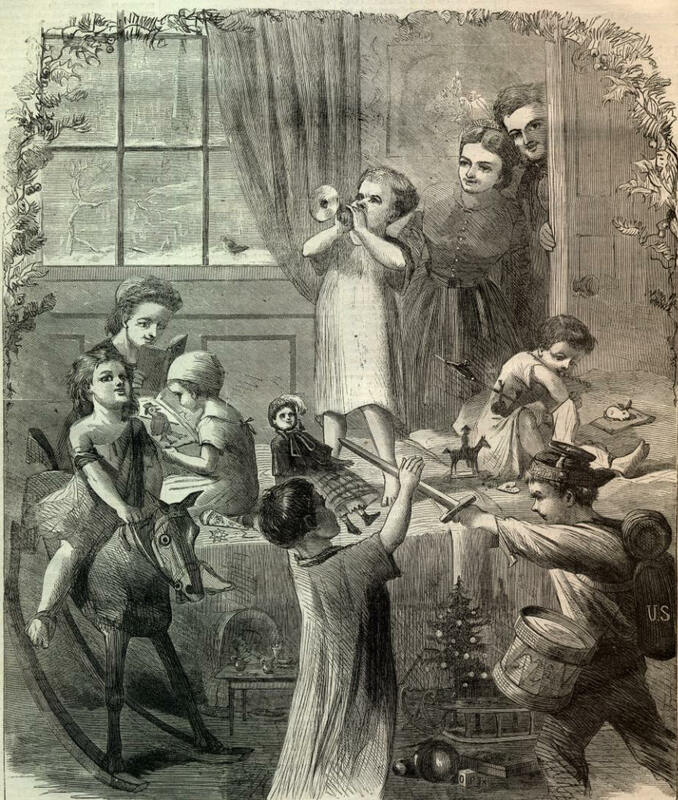 Children still found Christmas morning joyful in this December 31, 1864 Harper's Weekly edition. Note that the youngster on the right is equipped with sword, drum, kepi and a haversack with ‘U.S.’ prominently displayed. This year saw the battles of Gettysburg and Vicksburg and the beginning of the end for the Confederacy. Thomas Nast portrayed Santa Claus in a patriotic uniform, distributing to Yankee soldiers to raise their morale. Southern parents were gently preparing their children that Santa Claus may not "make it through the blockade" to deliver presents this year. Harper's Weekly depicted a tender reunion scene of a soldier husband and father briefly reunited with his family during furlough. Holiday boxes and barrels from home containing food, clothing and small articles of comfort were highly anticipated by soldier recipients. Depending on their duty assignment, Christmas dinner may have consisted of only crackers, hard tack, rice, beans and a casting of lots for a single piece of beef too small to divide. Those lucky enough to receive boxes from home could supplement a meager meal with turkey, oysters, potatoes, ham, cabbage, eggnog, cranberries and fruitcake. "The north wind comes reeling in fitful gushes through the iron bars, and jingles a sleighbell in the prisoner's ear, and puffs in his pale face with a breath suggestively odorous of eggnog." "Christmas Day! A day which was made for smiles, not sighs—for laughter, not tears—for the hearth, not prison." He described a makeshift dinner set on a tea towel-covered box. Each prisoner brought his own knife and fork and drank "Eau de James" (water from the nearby James River.) Cavada reported he combed his hair for the occasion and further related that the prisoners staged a "ball" with a "great eal of bad dancing" during which hats were crushed and trousers torn. Sentries called "lights out" at 9 p.m.
General William Tecumseh Sherman is host at a celebratory Christmas dinner in Savannah after presenting the captured city to President Lincoln. The final wartime Christmas came as the Confederacy floundered, Lee's Army behind entrenchments in Petersburg and Richmond. Abraham Lincoln received a most unusual holiday—the city of Savannah, GA—presented by General William Tecumseh Sherman via telegram. Union and Confederate sympathizers were hoping this Christmas would be the last at conflict. "Peace on Earth, Good will to men should prevail. We certainly would preserve the peace if they would go home and let us alone..."
"Our commissary sends word for each Orderly Sergeant to come to his wagon & he will issue one piece of soap to each man. This is indeed good news. Since the Skirmish began at Stockbridge Nov 15 we have not had a chance to wash any more than our faces occasionall & never our feet or bodies until now...."
Holiday season charity was not forgotten this year. On Christmas Day, 90 Michigan men and their captain loaded up wagons with food and supplies and distributed them to destitute civilians in the Georgia countryside. The Union "Santa Clauses" tied tree branches to the heads of the mule teams to resemble reindeer. "The one worn-out railroad running to the far South could not bring us half enough necessary supplies: and even if it could have transported Christmas boxes of good things, the people at home were too depleted to send them." Moods were more bouyant in Washington and New York, where celebrants supped on substantial feasts and attended the theatre. 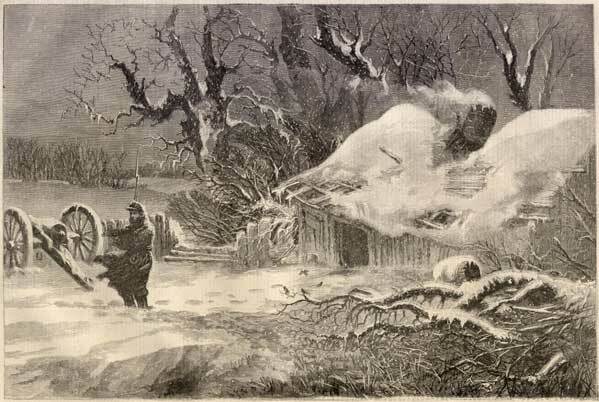 ‘Snowy Morning on Picket’ from Harper's Weekly, January 30, 1864. 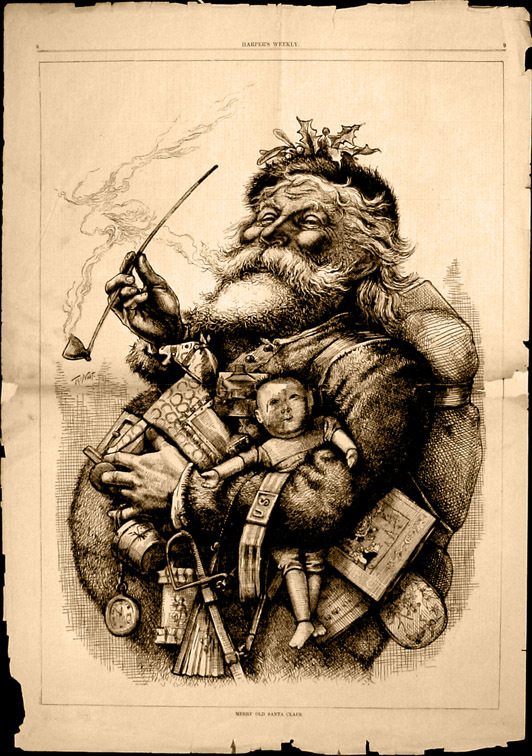 Thomas Nast's most famous image of Santa Claus was published in Harper's Weekly on January 1, 1881. 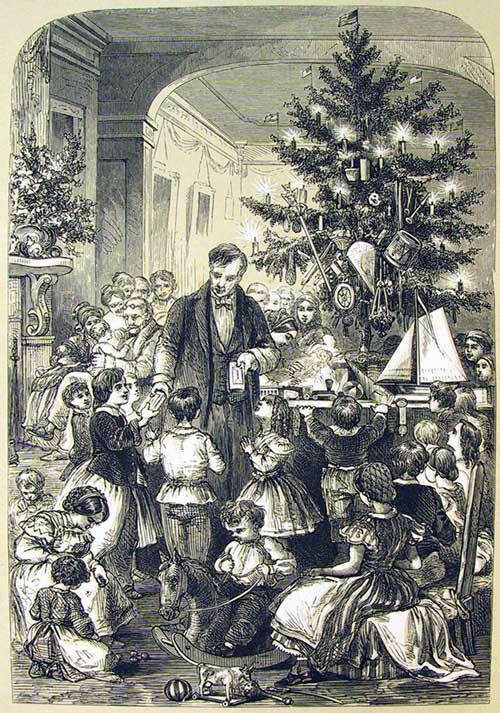 The events of 1865 again influenced holiday celebrations. President Lincoln's assassination shocked the nation, but by mid-summer, the conspirators were hung or imprisoned for lengthy terms. War was ended and many soldiers had been mustered out of service. The 13th Amendment to the Constitution became law on December 18, 1865, abolishing the institution of slavery. Soldiers and civilians alike were ready to reunite with their families and again embrace Victorian holiday customs. At the end of hostilities, commerce once again flowed southward, and goods filled Northern shops. Long-held holiday traditions were re-introduced, as ornamental greens and trees filled the markets and toys and other items went on display. Newspaper illustrations were of domestic and wintry scenes. To keep the Merry Christmas here.